New Directions Special Educational Needs (SEN) Department would like to announce Yukie De Brito from Cardiff as their Temp of The Month. The decision was made because Yukie has shown nothing but being reliable and professional within every booking that the team have placed her in. Even before Yukie secured her long-term placement she would always ask if there was work, and was willing to travel for any of her bookings. We find her to be extremely reliable and committed to any booking that is given to her, always punctual arriving for school with a positive attitude. Yukie is always well prepared for her placements by researching the location of the school, plus she builds good working relationships with her colleagues and staff members within each school. The class teacher that Yukie works with mentioned that “Yukie had become an important part of the nursery and she has a lovely calming way with the children and she encourages them to always do their best and try new things”. They also went onto mention that Yukie works extremely hard and has fitted in really well and will be sorely missed when she leaves them at the end of the school term. They wish her all the luck for her future. 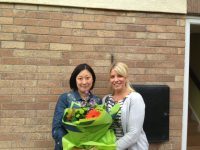 Jess Sibley from the SEN Department presented Yukie with a bouquet of flowers and certificate for all her hard work, Yukie was surprised and grateful that she had won ‘Employee of The Month’ and wishes her all the luck for the future.